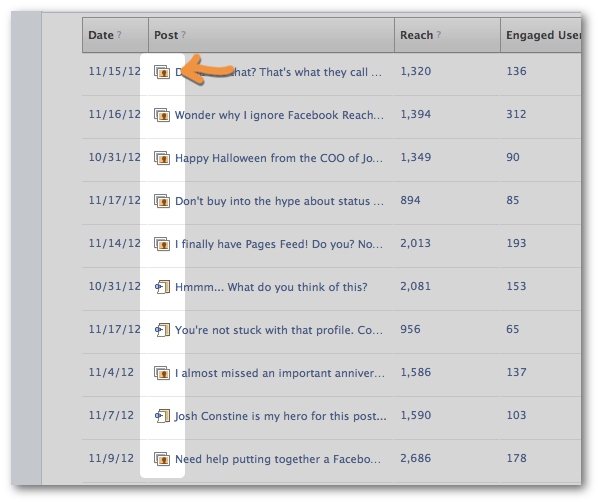 I wrote an article for AgoraPulse yesterday called Hidden Gems Within Facebook Page Insights: Virality and Viral Reach. In the process, I uncovered just how easy it is to find stats that prove or disprove assumptions. Think that photos are the most viral content type on Facebook? Use the Virality stat. Disagree and think it’s all about status updates now? Rely on Viral Reach. It’s a metric that is used within Facebook’s web version of Insights. It’s rather straight forward, but you’ll soon see why the smallest quirk in the definition makes a huge difference. During the past month, seven of my 10 most viral posts were photos. All of the top five were photos. And only the 10th was promoted. Additionally, the other three weren’t status updates, a post type that has received a lot of attention recently for its apparent surge in Reach. No, all three were link shares. In fact, even though I have made more of an effort to use status updates lately, such a post didn’t show up on my list of “most viral posts” (according to Virality) until number 17. Like I said, it all depends on how you look at it. When you consider Viral Reach, you get a completely different picture. Viral Reach is the percentage of people reached via a user generated story (like, comment, share). Get the difference? Virality measures the percentage of people who created a story. Viral Reach measures the percentage of people reached by a story. It’s an important distinction. I’ll get to what it tells us in a second. But when looking at Viral Reach, my top post was still a photo. The next four were all status updates. The reason for the significant difference in results all comes back down to Reach. As we’ve learned, status updates are reaching more users than are photos (on average). That doesn’t mean they get more engagement, of course. But more Reach. This goes back to how status updates and photos aren’t perceived as equal by the current iteration of EdgeRank. For whatever reason, Facebook is more willing to show stories generated about status updates than stories generated about photos. Does that mean that you shouldn’t use photos? Absolutely not! I go back to the initial “Virality” statistic. At least for my content, I get far more story-generating activity on my photos. Sure, I need far more stories created around photos to reach the same number of non-fans reached with stories for status updates. But it’s understanding value. If I want to reach the most people, I create a status update. But did that status update inspire any response? Any action? Anything of value to my business? If I want to get engagement, I use a photo. I see time and time again that they result in comments, shares and likes. Then again, we need to be careful about how we define “Engagement.” Facebook defines it as any click on your post. That includes activity that won’t generate a story. An example of how this makes a difference is two photos that had nearly identical Reach. One had 136 engaged users while the other had 312. But the post with 136 actually had more stories created — and Talking About This. Once again, it’s semantics. It’s using stats to prove whatever story you want to tell. Some will tell you that you should focus your attention on status updates now. You may even think that I would suggest focusing on photos. You should not create your Facebook content in a vacuum. I don’t suggest you try to find a photo that fits your content. That’s backwards thinking. Instead, use a photo when it enhances your content. If it isn’t necessary, use a status update. Read my extensive research on this in my blog post here.